My father is a teacher (Sanskrit) and my mother is home maker. No doubt in last 2-3 years there has been tremendous increase in online resources..but if not judiciously used it is very much time consuming and confusing as well. So I have relied on only a few websites and ignored others completely. Ignored PIB completely = never ever followed it even once. Read PDFs of vision/PPTs of mrunal = but always made hand written notes as I am more comfortable with pen and paper. Daily hrs spent on online for exam prep. Not regular as such – but mostly offline mode. Don’t go for unlimited internet plans.. otherwise you will open youtube for mrunal and aftersome time you will find yourself watching something else. Take a lot of mock tests = read solution = make notes = revise them. No change . I got 140 in pre with above strategy. I took a lot of mock tests (almost 70)= vision+ insight+vaji+forum = my intension was to have flavor of different levels of tests so that upsc pre should not be a surprise for me. Content and presentation are two key components. Writing introduction varies from person to person – quote/anecdote/data-figures etc are common preferred ways. I always tried to make some anecdote. Write atleast 4-5 essays before mains = its important with respect to time management because in exam we generally find cruch of time for second essay. Water disputes between States in federal India. Importance of water > scenario of water disputes in india > why such disputes > impact of disputes on our eco/society/polity etc > how & why it should be handles > if handled properly positive outcomes > conclusion. Intro in the form of an anecdote > what is cyberspace > how is it blessing ( various dimensions = pol/soc/eco/etc) > how is it curse( various dimensions) > what should be done to minimize negative impacts > conclusion. Both intro and conclusion should be around 1 – 1.5 page..one para intro conclusion as per me is not justified. Culture I did same for pre and mains. Same source. Pratik nayak sir world history section was posted very close to mains so couldn’t watch it then..but it think it should suffice along with above. Max 2 questions will be asked,it should be kept un mind. so don’t go too deep. Indian Constitution, devolution, dispute redressal etc. Entire gs2 = question can be static based or current based. Static = vision value addition material for each of the below topics. Current = vision ias current affairs +insight secure + vision mains test series solution + rstv videos on certain issues. Indian economy, resource mobilization Entire gs3 = question can be static based or current based. General strategy = understand key words in layman terms not bookish definition. Answer every question wrt administrator fram of mind . eg quotes are asked for explanation = explain them wrt current scenario of administration. Give current examples. moral thinkers of India and world Only those who were covered in above sources that too not very well = I think not too much focus should be given on this…because they are going to ask application based questions only which can be handled otherwise also. Eg this year ques was on rawl concept of social justice= I was not aware of this rawl guy = but I know what is social justice very well = so I explained it. Just like dharma where all babas are fighting/divided over how to attain moksha/nirvana = same is the case in upsc also = I am part of the clan which says attempt all even if you have only vague idea. I think most of the students(including me) don’t have too much deep knowledge which could fetch us extraordinary marks even by attempting only 15 questions. So attempt all 20 average quality answers. No problem = too much space is given. I do follow intro body conclusion format . I think it should be followed. In upsc content & presentation are equally important . Hindi literature; reason already mentioned. I chose my optional purely on interest. I am from engineering backgroung and i like writing hindi poems/gazals..so I opted hindi literature without asking anyone. I think personal interest should prevail rather than above rumors. It’s a good optional If you like hindi and you are comfortable in writing in devanagri script . Samvad ias class notes + studymaterial + drishti study material + all those novels/books which are explicitly mentioned in the syllabus. It will take around 4 months @ average pace. Post pre I started answer writing.. I tried to write one test per week . Self notes yes = completely in paper format. Difficulty level was more wrt 2015 paper. Not much changes required..work can be done on speed. I am from English medium so speed of writing in hindi is a bit slow. Although mocks are always different from actual interview..but I think it should be taken ( not much) because here also only content is not enough..presentation also matters. sir after working for 30 35 years in any job i would definitely seek that it should provide me personal satisfaction and professional excellence. And the civil services because of its job diversity, decision making roles,huge opportunity to contribute directly in the nation building process,good social status and a decent salary fulfills both my personal aspirations and my obligation towards the society. how are you mr keshav kumar?you are the last person to be interviewed today..so what were you doing till now? 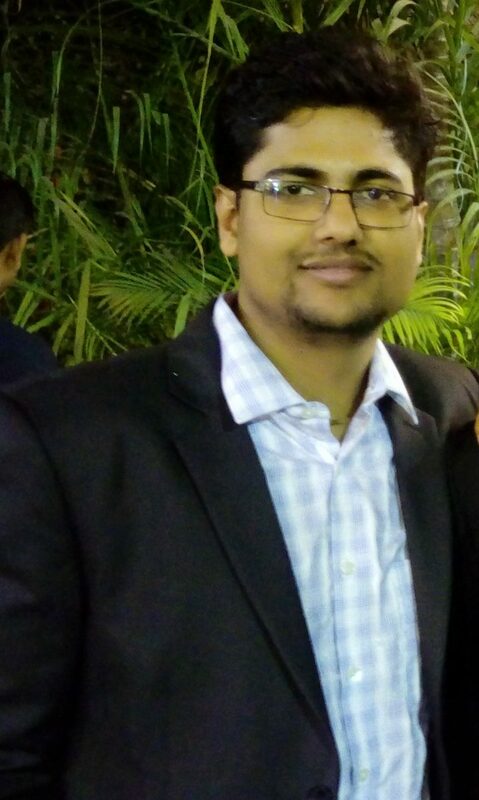 1)you did your b.tech from NIT patna…so tell me some good and bad things about patna. 2)were you in some form of contact with the local people near your college? 3)people say they want to give something back to the society..do you agree? 4)what did you get from society till now? 5)name some of the officers who have done excellent job in service. 7) you are an engineer then why did you take hindi literature as an optional? 8) these days we see a lot of train accidents,flood,etc etc… one word for this is? 10)some of the disaster we have faced since 2016? 11)why are we so concerned about disasters? 12)which is the national level agency to deal with them? 13)name the force to deal with them? 14)under which ministry does it come? 15)SDMA comes under which ministry? 16)bihar has great contribution in our freedom struggle…can you name some of them? 20)what was do or die? 21)who is called the father of modern india? 22)why is he called so? 23) in which languages he wrote books? 24)why gandhiji was against macaulay’s point of view on education? 25)in 1950 there was some controversy over official language..what was the issue? 26)what was gandhiji’s point of view on this? 27)how much percentage of india speak in hindi? 28)so is it justified that hindi should be official language?let me refine the question..should only hindi be official language of india? 29)some amendment in act was made regarding this official language..what was that? 30)there was also a tribhasha sutra? 31)what was your job role in alcatel lucent? 32)what is a virtual machine? 33)there are many railway related services in cse…why railway is so important? 34)what is its social obligation? 35)why people need to move from one place to another? 36)so does it mean we should run railways in losses for its social responsibility? 37)how can you make railways profitable? 38)but we don’t have so much rsources? 39)cant we go for withing country private investment? 40)so do you support privatization of railways? 41)why liquor and petroleum have been kept out of gst? 42)why a state like gujrat where we have prohibition,also opposed liquor to be in gst? 44)what if you don’t get ias and get ips…will you again give the exam again and again? 45)what is this international solar alliance? 46)whyare we focusing so much on renewable? 47)india’s target for solar energy? 48)solar energy is so costly..then why are we going for it? 49)you are an engineer, what would you suggest for bringing down its cost? 50)so you should have done fabrication work, why administrative job? 52)why insects are increasing near it? 53)name the first poet of hindi,some important modern hindi poets and your favourite poet? 54)so your hobby is poetry writing and recitation..can you recite some thing for us? 55)you did b.tech and then took hindi as an optional…don’t you think it would have been better if you would have taken humanity subject in your graduation? 56) what are the qualities of a good poem? For gen category = graduation certificate and 10th certificate only. Please reach on time. In my first attempt (2015) I reached late and my medical was denied that day..and finally it was done on last day L two months of torture. I would have given ssc cgl this year. It can be removed but then only 4 gs papers will make syllabus very small(luck factor will increase I think). Csat should be there. A minimum level of aptitude testing is required. Q. Despite what UPSC has done in last seven years in syllabus and pattern change, it has failed to curb the nuisance of Delhi’s coaching factories and the readymade e-material sellers. In fact, it’s increased under the new Mains-syllabus post-2013. Let’s face it, UPSC added so many topics and so many random questions, even fulltime student struggles to gather and process all standard reference books and material himself within the short time available to him. and This system work against an individual preparing from far-away area, without any financial resources, high-speed internet or contacts in Delhi to procure the said material in authentic or pirated form. Personally I think coaching institutes can ever be eliminated..whatever be the syllabus..so best thing is deepening internet penetration. Because in that case even in remote areas free lectures on websites like yours (mrunal)/unacademy can make it level playing. No.. analysis based questions are asked in mains..pen paper format is the best suitable format for this. Q. Half-merger of IFoS with CSE is a bad move because it has raised the cutoffs for players who’re solely dedicated to IFoS only (and not to IAS/IPS). Adding salt to the wounds, many who had applied for both jobs, cleared the prelims- they did not even bother to appear in all the papers of Mains-IFoS. This was my second attempt = parents and some close all weather friends are the reason of my survival. At personal level I feel all of us know what should be done/how it should be done..what we lack is self belief..after failure we should try to revive this..
gist is – we already know what is required for success but we forget because of pressure/self doubt/ negativity etc. 1st attempt = I started optional after prelims. So not much time was there. After clearing mains even with this attitude, I think if I would have been in right frame of mind ,the result would have been different. I believe in 3D strategy. D1 = DISCIPLINE = this exam doesn’t contain anything in its syllabus which a normal IQ person can’t understand. 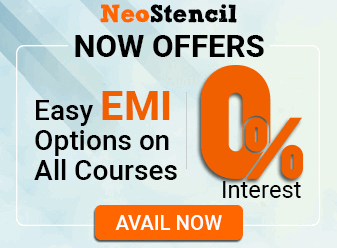 Every part of the syllabus can be comprehended very well provided we are disciplined. But what does discipline mean? It means keep on studying even when you don’t want to. i.e It doesn’t matter how you feel, get up , dress up and show up (one of my friends quoted this when I was extremely nervous after this years mains essay paper) …so our task is studying even when our “mood” stops us. D2 = DIRECTION = if you are very disciplined (ie posses D1) but your D2 is wrong…then all in vain..So what to study /what not to study/ how are we making notes/ how to revise / how to complete paper/ everything becomes very important. 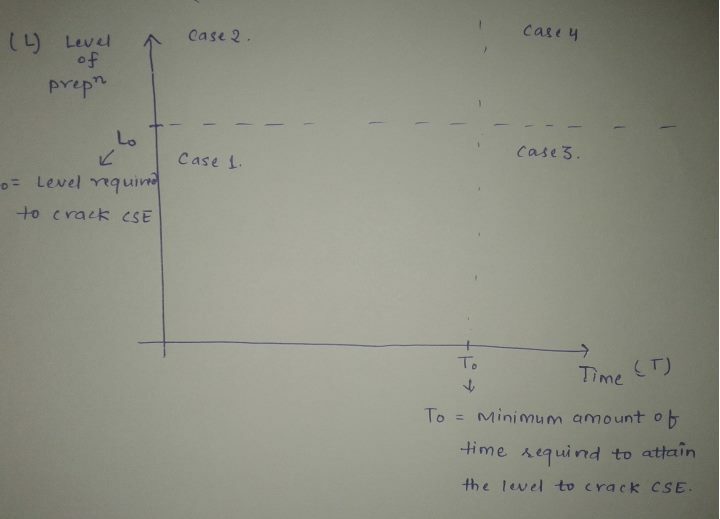 (this graph is between time axis= how much time we have given for preparation and y axis = level of preparation)I think there is some minimum amount of time and a certain level of preparation which is must to clear this exam ( as per me minimum 1 year before you are going to appear in CSE). It means You have not given the time required to attain a certain level for clearing this exam = if you appear in CSE = you will end up wasting your attempt in this case. Now as per me this is an impossible case. This is the zone in which a serious aspirant should fall in. i,e after giving a certain amount of time one should have attained that level which is required for selection. But…approximately how many people every year among all the appeared candidates lie in this zone? My guess is it should be 20-30k.i.e this is the number of students who have that level to clear the exam..
BOTTOM LINE: never ever fall in third quadrant..always target fourth one…i.e atleast achieve that level of preparation ..because after attaining that level- its all about D3 and nothing else!!!!! Always try to lie in fourth quadrant = and then fortune favours the brave. Obviously yes.…almost all the video lectures and most of the economy articles.. all the lectures are must watch. Plz guide me sir …mughe Kya krna chahiye….?? Sir can we get your hand written notes of Hindi Literature? Hello keshav sir,I m in big dilemma to choose optional between PSIR and Hindi Literature. Like you writting poetry is also my passion and it is very close to my heart.but after 10th I never studied Hindi Specifically.I was from Hindi medium till 10th.so It would not be so much tough to adopt Hindi as I was also topper in Hindi subject in whole district but that is like frog of a well.I just want an expert opinion on Hindi literature because I know that of I will write Hindi, i can put my heart out on paper.It might possible that I m overestimating myself so cutting whole story short just let me know scoring 300+in this paper is realistic goal or not. Sir I am very confused about coaching institute in hindi literature optional , sir I want to ask you that without coaching any one can complete the syllabus for hindi literature optional and 2nd thing I want to ask have you take the coaching for your optional if yes then which coaching . Please guide me? Plz sir hindi litlature ke liye kaun si books achhi hogi. I think you should go for vikas divyakirti notes from Delhi.